As I'm interested in Eastern European food, I use quite a bit of dill in my cooking. I bought a cheap packet of dill seeds a few weeks ago, and was amazed, after sowing them in a small terracotta pot, when they started sprouting in abundance. Herbs are difficult to grow in London, usually due to the lack of clean air, sun (like others, I've got a shady garden), and all the usual problems that come with city gardening. 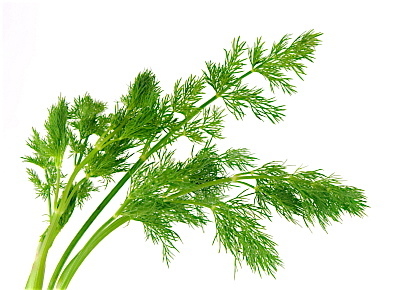 If you look up dill on wikipedia, you will find lots of info about this fascinating herb. Apparently, it was used to ward off witchcraft and evil spirits. I use it with fish. It goes beautifully with salmon, and marinated haddock; and many dishes with an East European slant will benefit from its aniseedy, liquorice flavoured taste.